Guys, tomorrow I’ll fly to the country with the most amazing Burgers I’ve ever eaten. Sadly Burgers in Germany most of the time don’t live up to American standards. Don’t get me wrong, there are some places with excellent Burgers here in Germany, too but they are few and far between. So most of the time I am more happy to make my own. Eating a bad Burger is just so wrong! Personally I am a very greedy person and I want it all. Taste and texture, sweet and spicy, a little acid, a fresh kick and also something salty. 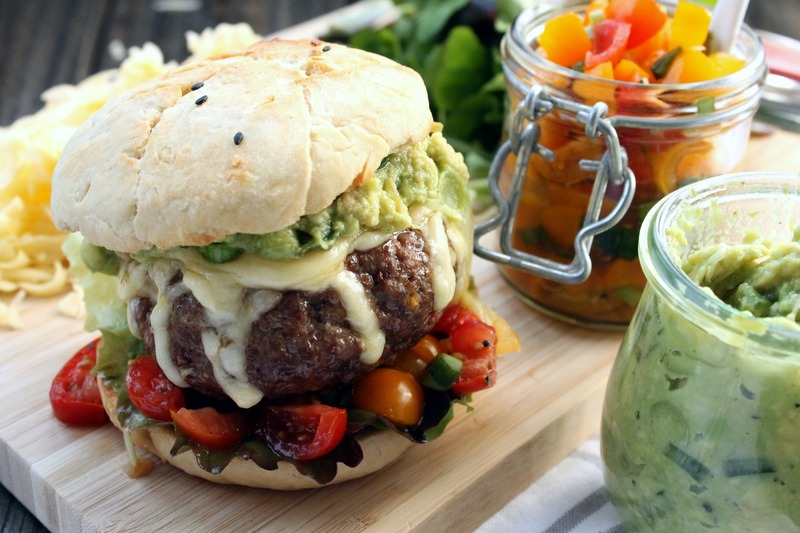 A crispy bun, a spicy and juicy patty and creamy guacamole. Salsa for a little acid, cheese for this delicous melty flavor and bacon to add some salty crispiness. People I can’t say anymore or I’ll start licking my screen. Now add the ground beef and knead through until the spices are completely mixed in the meat. I use my hands but you can also use a fork. The spicy paste will look and smell like too much for the meat. It's supposed to be that way. The meat will swallow some of the flavor. A little too much is exactly right! A few words on how I like to layer my Burger. For optimal texture experience I always alter a soft componentwith a crispy one. On the bottom half of the bun I start with the salad. Then I add the salsa and the burger patty with the melted cheese on top. Next there comes the bacon which is going to be topped off with a giant dollop of guac. On top there goes the top half of the bun. … now you go figure! Okay guys I am officially totally gaga about a burger now and also pretty short in time to pack up all my stuff for the trip. I am excited and all kinds of happy. I’ll be gone for a full week and therefore not be posting up here. You can of course follow all my shenanigans in New York City and Cleveland on my Instagram. If we’re not friends by now add me and let’s become friends. Oh I can just imagine how good all those spicy flavours would be in a burger – Indian spices are just the best but I have never done them in a burger before… Need to rectify that! Do it! I can see you liking it! 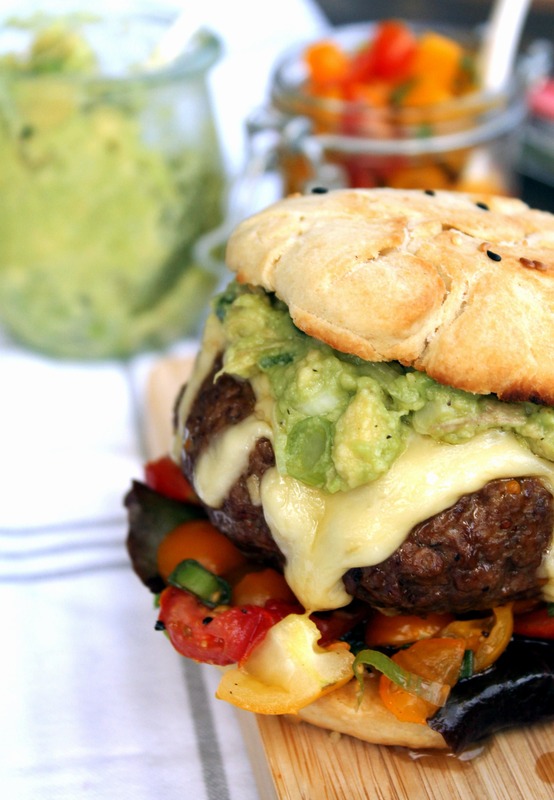 This burger…holy freaking havana, I need it.